Jockey Kerrin McEvoy has given his stamp of approval for Youngstar to take her place in the Queensland Oaks in a fortnight following her impressive win in the Group 2 $175,000 Magic Millions The Roses (2000m) at Doomben. 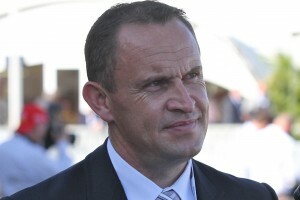 Trainer Chris Waller, above, trained the quinella in The Roses at Doomben with Youngstar and Another Dollar. Photo by Daniel Costello. McEvoy brought the Chris Waller trained Youngstar ($4 favourite) from the middle of the pack to claim her stablemate Another Dollar ($5) over the concluding stages with Highway ($51) holding on for third after attacking the leaders on the home turn. Youngstar has risen up through the ranks very quickly with a maiden win at Hawkesbury two starts back followed by a win at Newcastle over 1885m in a BenchMark 68 Handicap and now she is favourite for the Group 1 $500,000 Treasury Brisbane Queensland Oaks (2200m) at Doomben on May 26. McEvoy said that Youngstar appreciated the step up in distance today and will handle the next step up to the 2200m in the Queensland Oaks. “She is a filly that I have liked and the stable has liked for a while and she came here today with a nice chance with a couple of wins already this prep and the 2000m really suited her,” McEvoy said. The win of Youngster brought up a double for the Waller – McEvoy combination after they combined earlier in the day to win the Group 2 $175,000 Moet & Chandon Champagne Classic (1200m) with Zousain. Youngstar is now the $5.50 favourite for the 2018 Queensland Oaks at Ladbrokes.com.au just ahead of her stablemate Another Dollar at $6.